A Construction Science degree with a focus in Engineering and Construction from one of the largest Construction Departments in the nation (Texas A&M). 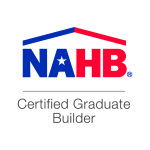 A Certified Graduate Builder designation, along with many other certifications. A strong background in complex structures through extensive commercial experience. Steep grades, large retaining walls, huge expansive openings. An MBA degree with a focus in Marketing, which ensures longevity of the company. Shan & Bethany both hold MBA degrees. An MIS Degree, and a strong background in systems development has resulted in the many proprietary systems that make up the Jenkins “Perfect Building Experience”. 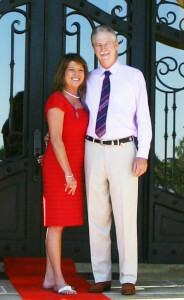 A passion for building quality custom homes. Shan and Bethany Jenkins love designing and constructing great homes.The goal of these owners is simply to pursue excellence in each and every custom home they design and build. The beauty of a Jenkins home is more than skin-deep. While we believe our finish-out is unparalleled, we know that what is behind the walls is as important to the long-term value of your home. This can only be achieved by understanding the science behind building a home. At Jenkins Custom Homes we’re fanatical about building a home according to proven scientific methodologies. Through our educational background in construction, along with years of experience in both commercial and residential building, we have learned the proper materials and installation procedures for ensuring the long life and minimal maintenance of your home; methods that most home builders do not take the time to research and understand. While there are far too many of them to cover here, below are just a few stages of the home building process and how, at a very high, level we address quality control at these stages of home building. Most home builders don’t have the knowledge or resources to provide an accurate and detailed cost breakdown without having complete plans. The problem is, by the time you have a complete set of plans, you’ve already spent a lot of money and time with an Architect. Architects generally don’t maintain an extensive cost database that is current; nor do they need one. In addition, we often find that knowledge of design and construct-ability (which includes cost-effectiveness of design) are two very different things. For example, land with significant slope (topography) can be designed many ways, some cost-effective and some not. There could be a savings of tens of thousands of dollars or more by having a knowledgeable home builder at your side from the very beginning of the design process. Second, Jenkins is one of the only custom home builders that guarantees that we will be within +/- 5% on the original design cost. We can do this because we’ve developed a proprietary job costing system that allows us to tell you what your home will cost, in a great amount of detail, even before you have final architectural plans. We are one of the only home builders that provide a detailed cost estimate with the original design. This gives our customers a Proof of Concept or Feasibility Study on the custom home they want to build to ensure it is within their chosen budget. There is a warm feeling that defines a Jenkins Home. A completeness to the look of the home that is the result of Jenkins’ focus on the design details. Jenkins Custom Homes incorporates more finish-out elements into their homes than other builders can provide at anywhere near the price. In many cases we hand draw and develop the details ourselves from wrought-iron accents on cabinet doors, to antique corbels and handmade tile mosaics. We don’t just throw in these elements randomly. We stay true to the style of the home, whether it’s Tuscan, Spanish, Hill Country or Modern. 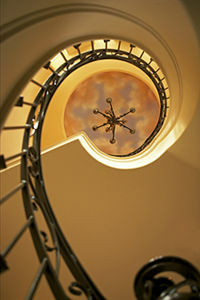 And we make sure your style is reflected in every aspect of your home even the landscape design matches. People who have traveled comment on how true Jenkins stays to each style.